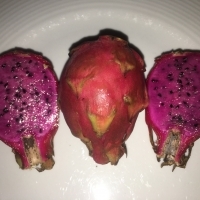 Also known as the Dragon Fruit, the Pitaya is a stunningly beautiful fruit with an intense colour and shape, magnificent flowers and a delicious taste. 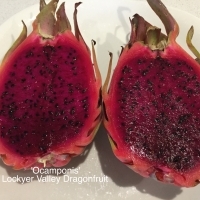 Once only seen in the finest restaurants it is fast becoming common-place throughout Australia as a garnish and a delicious fresh fruit. 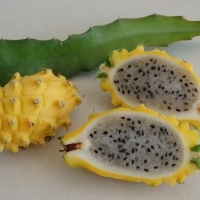 To eat the fruit serve chilled and cut in half. Scoop out the flesh and seeds much like a kiwi fruit. 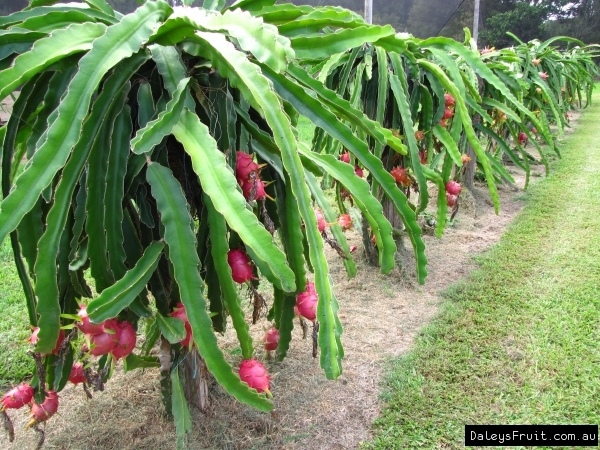 Medium sized magenta fruit, its very sweet and is a Hylocereus Polyrhizus cross. Small, duck egg sized fruit, purple flesh and brilliant flavour. Heavy flowering vine that is self fertile. 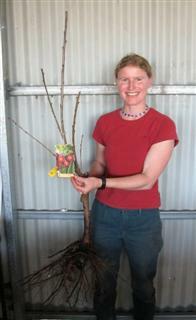 Produces abundant pollen for pollinating other varieties. Red skin and firm, vibrant electric magenta coloured flesh. 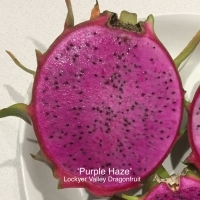 Purple Haze produces an abundance of fruit with and a definite grape flavour. 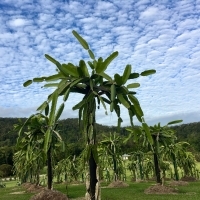 Fine seeds similar to those of kiwi. 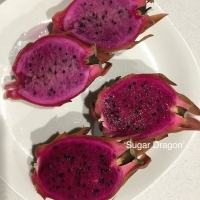 Large Yellow thorn less Dragon Fruit, excellent quality up to 1.5kg in weight. 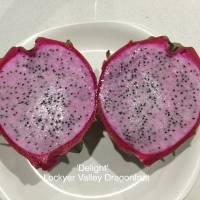 Use Pearl Dragonfruit as pollinator Trial Product, Daley's is currently propagating this product, we should have limited quantities available in March 2019. 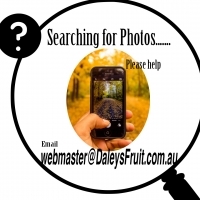 If you are interested in this item please request the email notification from this page. 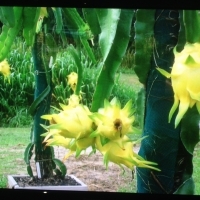 These strongly scented trumpet like flowers are freely produced in late summer followed by fruit in 4-8 weeks. Orange-red skin with vibrant pink-red flesh. 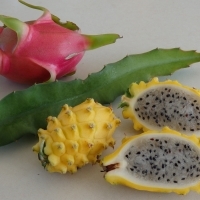 Best flavoured pitaya, but very thorny. 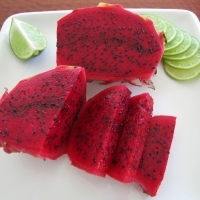 The skin as well as the sweet pulp of the fruit are a wine-red color. Usually eaten out of hand. 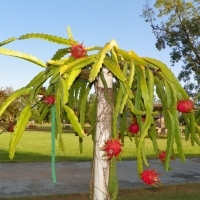 This plant is attractive to bees, butterflies and birds. The flowers are fragrant. Requires a sturdy trellis to grow on. 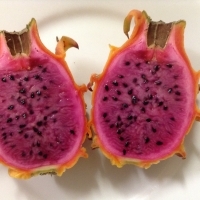 A purple fleshed variety with great colour and a delicate light flavour. 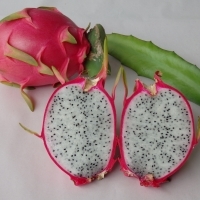 Bob Brinsmead's favourite selection from Tropical Fruit World.